With a refreshing new design (iBook anyone? 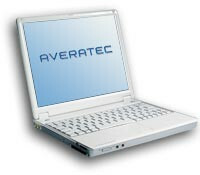 ), Averatec’s 3700 series has a unique white shell. And at just 1.9kg this ultra-lightweight laptop could be an ideal system for travel, school, as well as work, as long as you don’t throw CPU-intensive programs at it or work too long untethered from a mains adapter. Better suited to those on a budget, the 3715-EH1 offers a respectable range of hardware features in a highly portable casing. You’ll either love or hate the styling (we weren’t fans), but the price might be enough to attract you if your needs are basic (Web browsing, managing e-mail etc). In addition to the disappointing battery life we found that the working range of the wireless adapter was below average. Power users looking for an ultra-portable laptop who can manage to spend a little more on customisation options will find much specified and powerful options from the likes of Dell and Sony. 3000+: » Further information can be found in our Comparison of Mobile Processsors.